When I designed the game that became Panzer Grenadier, I had this delusional vision that it would eventually number dozens of boxed games with dozens of additional add-on supplements. This has more or less come true, but doesn’t make the original vision any less delusional — the realistic probability of some teenager pulling this off with a game design of any sort is about the same as I had of winning the Heisman Trophy. Which I also intended to accomplish. At some point I typed (the personal computer being unheard of in my family’s economic circles) a list of all the wonderful games and add-ons that this series would include. The add-ons were most definitely part of the hallucination, and at the very top of the list (I still have this list) sits one called Go for Broke. We first brought this out several years ago, and now it's returning in a revised new edition. I’m not sure when I first learned about the heroism of the Japanese-Americans of the 442nd Regimental Combat Team; I remember seeing the 1951 movie with Van Johnson on AFN when I was in elementary school. So I always intended Panzer Grenadier to include the 442nd (and the 100th Infantry Battalion) in their own color scheme, with many scenarios for them. Now that it’s in print, it's a much better product than I hallucinated way back when. Mike Perryman designed 29 scenarios of 442nd action: Half of them take place in the 1944 Italian campaign, and half in the French campaign (this includes a couple from the regiment’s brief re-deployment to Italy in 1945). They’re infantry-oriented of course, but they’re pretty tense: the 442nd’s fearsome fighting reputation led to its employment at the focus of the action. Sizes range from small (one map, a battalion or so per side) to quite large (six maps and the full regiment in action). Over the years, Mike has designed hundreds of Panzer Grenadier scenarios (I think it’s in the hundreds — it could be more) and continues to improve his craft each time out. This is a very nice set. Series developers Matt Ward and Daniel Rouleau have revised the first edition scenarios so that they draw only on the new boxed games of the Fourth Edition wave for maps and piees (in this case, Invasion 1944, Elsenborn Ridge and Liberation 1944). And they’ve added a could of battle games to tie the scenarios together with operational-level goals for the players. There are of course the background articles you’d expect in an Avalanche Press supplement. There’s a history of the regiment in battle, the story of the Japanese internment camps, and the regiment’s impressive roll of honor. And then there are the toys. Panzer Grenadier players love their colorful pieces, and Go for Broke does not disappoint. The entire regiment is present with its own special regimental symbol, plus the Nisei 522nd Artillery Battalion and 232nd Engineer Company that made up the rest of the Regimental Combat Team. 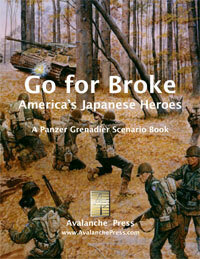 There aren’t any tanks, but the 442nd gets all of its infantry and supporting units, and they’re going to need them in scenarios that feature Nisei units together with other Americans: The 442nd’s morale is substantially higher than that of other units, particularly so after they gained combat experience. There are 77 die-cut-and-mounted playing pieces. Altogether, it’s a very nice package. After showing the Waffen SS in two books, and looking at the Poles, Finns, Slovaks, Italians, Austrians, Lithuanians and a whole lot more, it’s about time we got around to the finest fighting regiment of World War II. America treated its heroes shabbily, and it’s nice to give them a tiny sliver of their due. Click here to order Go For Broke right now!